Boarding schools for troubled teens are specialized schools that assist teenage boys and girls who are currently displaying out of control behaviors. These behavioral restoration program-schools provide therapeutic guidance, as well as academic repair and assistance. These types of programs for troubled youth are popular among parents due to their comprehensive academic curriculum and the many therapeutic services that they provide. Teens that display out of control behavior, suffer from psychological disorders, or are falling behind in school, are all very good candidates for a boarding school for troubled teens. Boarding schools for troubled teenagers are one of the most popular treatment options for troubled youth. These schools offer services such as academic restoration, drug rehabilitation and therapy for teens that suffer from psychological disorders. These therapeutic facilities usually require student enrollees to live on campus from anywhere between 9 months, to a full year. While there are obvious benefits that boarding schools for troubled teenagers provide, there are also a few drawbacks. Students that enroll at a boarding school for troubled youth will spend the majority of their stay locked in doors with little, or sometimes no time spent outdoors. This can be a problematic living situation for teenage boys who appreciate the outdoors or enjoy physical activity. It is no secret that teenage boys crave adventure. Troubled or not, teenage males enjoy adventurous activities that only the great outdoors are able to provide. Luckily for troubled teen boys, our program offers therapeutic, spiritual and physical therapy in a ranch-styled facility. 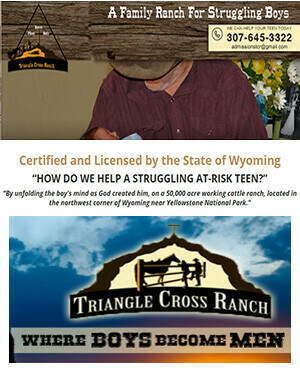 Through physical labor around the ranch, equine therapy and drug and alcohol rehabilitation classes, Triangle Cross Ranch is able to reach out to a wide variety of troubled boys and help teenage males overcome their individual behavioral issues. If you are a parent of a troubled teen boy and you are in need of immediate assistance, please call Triangle Ranch today! You can reach us anytime at 866-471-6695. Boarding schools serving troubled teens and their families in Alabama (AL), Arkansas (AR), Alaska (AK), Arizona (AZ), California CA), Colorado (CO), Delaware (DE), District of Columbia (DC), Florida (FL), Georgia (GA), Hawaii (HI), Idaho (ID) Illinois (IL), Indiana (IN), Iowa (IA), Kansas (KS), Kentucky (KY), Louisiana (LA), Maine (ME), Maryland (MD), Massachusetts (MA), Michigan (MI), Minnesota (MN), Mississippi (MS), Missouri (MO), Montana (MT), Nebraska (NE), Nevada (NA), New Jersey (NJ), New Mexico, (NM) New York (NY), North Carolina (NC), Ohio (OH), Oklahoma (OK), Oregon (OR), Pennsylvania (PA), South Carolina (SC), Tennessee (TN), Texas (TX), Utah (UT), Virginia (VA), Washington (WA), West Virginia (WV), Wisconsin (WI), Wyoming (WY), Washington DC, Canada, Mexico, Cayman Islands.